The existing port of Limon was constructed over 30 years ago. With the increase of import and export activities in Costa Rica and Latin America in general, a new, up-to-date container port needed to be constructed to handle the steady stream of vessel traffic in and out of the country. In parallel to all the pre- and present construction involved—dredging, seawall manufacturing, permanent pier support—all environmental conditions must be monitored, both terrestrial and marine related. Coastal erosion and offshore metocean parameters were required to be measured during the construction phase of the project and began in the Spring of 2016, for a duration of three years. Costa Rica is very environmentally conscious. All parties involved in this project must adhere to strict environmental standards. A met-station has been installed on the beach close to the construction site and a metocean surface buoy system has been designed, shipped, and deployed 1 km offshore from the new port facilities. Full meteorology at the sea surface—wind speed and direction, barometric pressure, air temperature, and relative humidity—along with water-column current velocity and direction and turbidity, are sampled on an hourly basis by a CR6 datalogger, with data transmitted to the shore via the cell phone network of the region. Water-column current velocity and direction were measured with an acoustic Doppler current profiler (ADCP) from Teledyne RD Instruments (TRDI) mounted on the buoy. Turbidity is measured with a Campbell Scientific OBS501 Smart Turbidity Meter with ClearSensor technology. Another TRDI ADCP was deployed separately near the buoy system to collect wave spectra: height, frequency, and direction (self-contained data, non-real-time). Buoy data is received at the client’s main office in San Jose and disseminated to all parties for viewing. Both offshore systems are serviced on a four-month schedule. In March of 2016 the offshore plan for environmental monitoring the new port construction in Moin was established. Once all logistics to transport, build, test and make ready for sea were completed, the system was loaded aboard the project’s work vessel MAGGIE-M and taken offshore for deployment. Depth is shallow (16 m) and only 1 km from the pier. Deployment took less than an hour pier-to-pier and was a complete success. Weather was perfect, with no wind and calm seas. Wet-data transmission was confirmed immediately due to the Campbell Scientific LoggerLink app on the project lead's smartphone. All parameters were coming in as planned. Further monitoring took place for the next few days to make sure all was well before project personnel departed the region. Data continued to report daily. ADCP data will be downloaded manually upon recovery in July. After nearly a year of planning the initial phase of the monitoring project, everything was a complete success. The CR6 datalogger and all sensors, including the OBS501 and ADCPs, performed perfectly and continue to do so at the time of this writing. 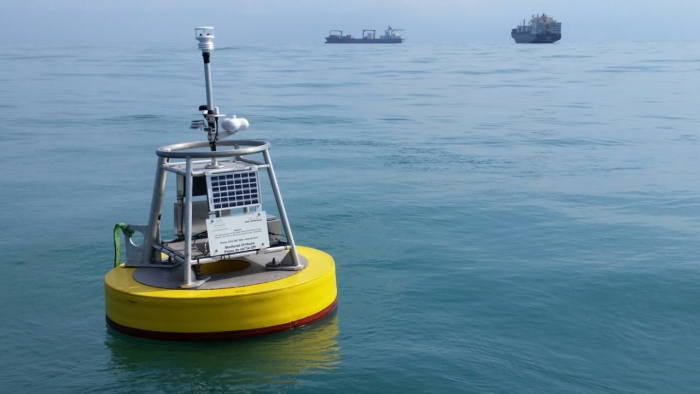 The buoy system is an RDSEA design, and partnering with Campbell Scientific in Logan, UT; their subsidiary Campbell Scientific Central Caribe in San Jose, Costa Rica; and Teledyne RD Instruments made this project complete.